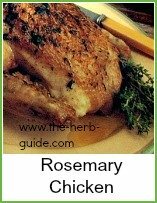 Rosemary is a very versatile herb. It's ornamental and is quite hardy. It's evergreen and has blue flowers in late spring. 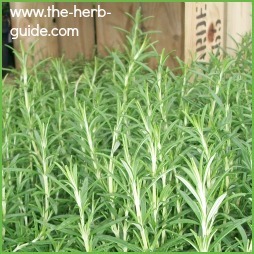 It's a very good value plant, as it grows to 3 to 5 feet high and makes a good backdrop to your herb garden. It's equally at home in a border with plants other than herbs. As long as it has full sun and well drained soil, it's happy and will flourish. It does tend to get a bit 'wild' - what I mean is, it needs clipping back to keep it to a good shape, otherwise it just flops and can take over the border. You plant it in late spring and if you can, protect it from the cold for its first year - just drape some bubble wrap or horticultural fleece or similar and peg it down to prevent it from blowing away in the winter. It can die in very cold winters, so it's a good idea to have a replacement ready. It's easy to take cuttings from - just take about 4 inch cuttings in mid to late summer (about July in the northern hemisphere). Strip the cut end of its leaves for about 2 inches then dip in hormone rooting powder - put into some good compost, water gently and then leave the cuttings in a shady place. They will need protecting from the cold, so put them in an unheated porch or similar. 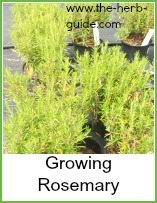 By the following spring, they should be ready to plant out or sell - growing herbs for profit is as easy as that! It's used in cooking with lamb, pork, veal and rabbit. It's good with chicken, mushrooms, eggs and cheese, but use it sparingly as it can be overpowering. 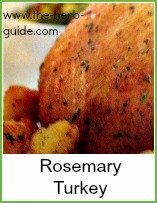 Rosemary potatoes are a particular dish that goes well with many plain grilled meats. Sprigs can be added to a jar of olive oil to make rosemary oil. You can use this to brush lamb, pork or veal steaks whilst they grill - either on the barbecue or your indoor grill or griddle. Strip leaves off a couple of sprigs, pour some boiling water over and allow to brew to make a diruetic tea. An infusion in boiling water can be used (once it's cooled) as a final rinse for oily hair. The smell it leaves will be divine. 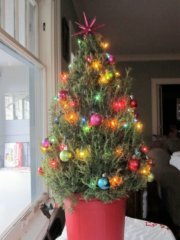 A Rose mary Tree is a very popular alternative to a Christmas Tree. It was associated with prosperity and fertility and the Romans used to give it to the bride and groom at their wedding. If you smell the crushed leaves, you can feel the aroma trickling through your sinuses - Greek students used to twine it in their hair at examination times to help them remember. It was thought to be a disinfectant and was used against the plague - didn't work though - but some people do put it in the wardrobe to keep clothing free of moths - much nicer smell than mothballs!